sanded, stained and then finished with furniture grade lacquer. Now available with standard 3-1/2" or a deeper 5-1/4" cabinet for larger swords. mounted to your wall. This cabinet has an installed lockable latch. (sword shown is not included). 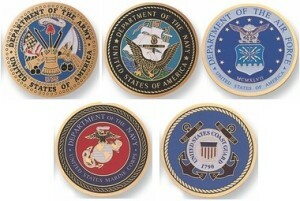 Comes with free laser engraved nameplate - plaque and full color service emblem. Sword, and more. Moveable matching sword stand included. Brass hinges and door latches. Cabinet comes ready to be mounted to your wall. This cabinet has an installed lockable latch. (swords shown are not included). 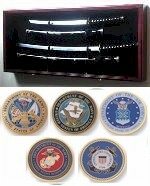 Short swords, Daggers, Knives, or Tantos display case cabinet in solid furniture-grade beech hardwood. Display case features a locking acrylic door with two keys to keep out dust and a felt fabric background. and installed wall hanging hardware. (swords and scabbards shown are not included). Important note: Please make sure your sword and scabbard are within the inside measurements of this case before purchasing. This case comes with a default RED felt background but other color options (Blue or Black) are available. 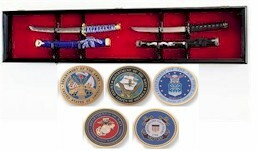 Comes with 1 free engraved name plate and full color military emblem.